USB connector there are only 2 kinds, namely the connector type A and type B connector, as shown below. Type A connector used to connect the USB cable into the USB terminal on the back of the computer the last few years of production. Type B connector used to connect the USB cable into the USB terminal on the equipment, for a simple USB devices, such as mouse, usually do not use the connector B, to save cost in the cable directly connected to the inside of the mouse. Specified in the standard reference pesyaratan very strict to USB cable, not just the cable can be used, all the more for USB full-speed transfer of data to 1.2 Mega bps. So that the USB cable always sold as a ready-made, one end attached to the connector type A and the other end attached to the connector type B, no one sells it off the USB connector. On the computer, usually there are two terminals for connector type A, so it can easily be paired with 2 pieces of USB devices. Manufacturing company that makes the mother board there is an additional USB terminal, you can buy if you want to add more than 2 USB devices. 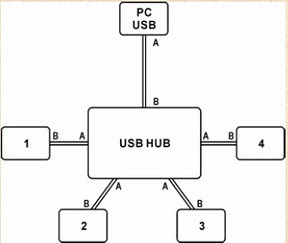 USB terminal on the computer named as 'Root Hub' Another way is to use a USB hub as shown in the figure, in this way can one USB terminal on the 'broken' into four. Each of these fractions can also be connected to another USB Hub, as well as onward connection to connect to as many as 7 levels, which could eventually connect to 128 pieces of USB devices!